After a three year hiatus Bon Om Touk, or the Cambodian Water Festival, returned to the Kingdom last week. Meant to mark the the reversal of the flow of the Tonle Sap river – and the associated fishing and agricultural fertility that brings – the festival is one of the biggest holidays in Cambodia. 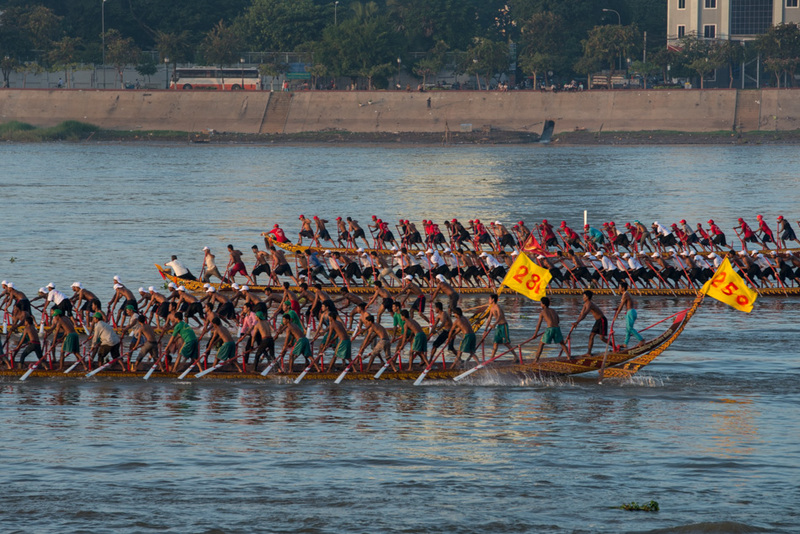 Over three days of races, long boat crews from all over Cambodia converge on the capital, seeking to win honour (and hopefully a piece of the prize money) for their home towns. Despite the historical and cultural importance of the festival, the tragic stampede incident in 2010, which saw roughly 250 dead and 750 injured led to the suspension of the event for three years – though strong arguments could be made that the government, fearing large gatherings of people during the past year of civil unrest, had ulterior motives for cancelling last year’s celebration. Political agendas aside, it was clear from the lower-than-normal turnout that the memories of 2010 have had a stigmatic effect. In past years the estimated number of attendees was somewhere close to two million, whereas this year – despite having very little in the way of official census information – it was widely agreed that not even one million were present. Fear of a repeat disaster, it would seem, has tarnished the festival’s popularity. Diminished crowds aside, the festival is still one of the most significant events in the Cambodian calendar year, and worth checking out if you’re in Phnom Penh at the right time. A race crew receives last minute equipment from their supporters before beginning practice runs ahead of their race. Cambodia’s annual 3-day water festival celebrates the reversal of the flow of the Tonle Sap River - an event of large cultural significance because of the river’s role in national fishing and agriculture. The event was cancelled for three previous years in a row after the stampede incident in 2010, when nearly 350 people were killed and roughly 750 more were injured. A racing boat moves along the Tonle Sap for pre-race practice runs. Many event spectators have come from distant regions of Cambodia, and camp along the river banks for the duration of the festival. Cambodia’s annual 3-day water festival celebrates the reversal of the flow of the Tonle Sap River - an event of large cultural significance because of the river’s role in national fishing and agriculture. The event was cancelled for three previous years in a row after the stampede incident in 2010, when nearly 350 people were killed and roughly 750 more were injured. Racing boats move along the Tonle Sap for pre-race practice runs. Though the prize for winning boats is relatively small, sponsorships and private donations can make winning a profitable prospect. Cambodia’s annual 3-day water festival celebrates the reversal of the flow of the Tonle Sap River - an event of large cultural significance because of the river’s role in national fishing and agriculture. The event was cancelled for three previous years in a row after the stampede incident in 2010, when nearly 350 people were killed and roughly 750 more were injured. A racing boat crew warms up on the Tonle Sap river before their race. Cambodia’s annual 3-day water festival celebrates the reversal of the flow of the Tonle Sap River - an event of large cultural significance because of the river’s role in national fishing and agriculture. The event was cancelled for three previous years in a row after the stampede incident in 2010, when nearly 350 people were killed and roughly 750 more were injured. A racing boat coach encourages his teams before their race. 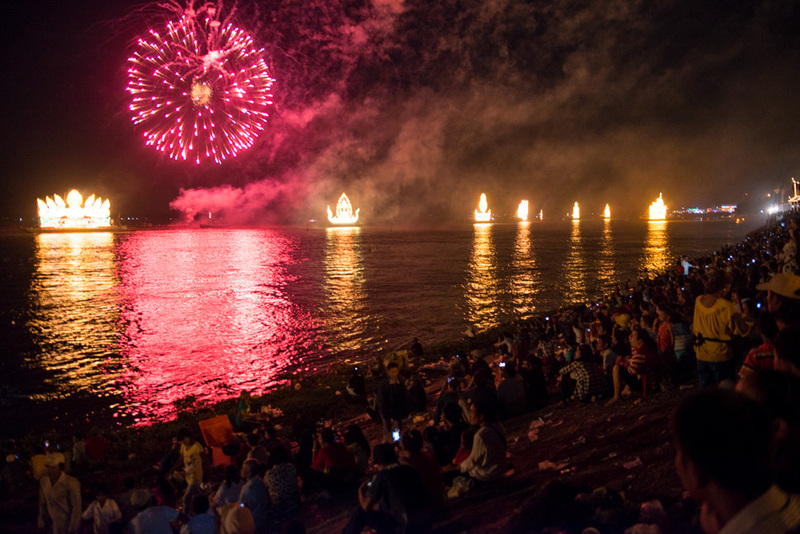 Cambodia’s annual 3-day water festival celebrates the reversal of the flow of the Tonle Sap River - an event of large cultural significance because of the river’s role in national fishing and agriculture. The event was cancelled for three previous years in a row after the stampede incident in 2010, when nearly 350 people were killed and roughly 750 more were injured. Two boats pass under the Japanese bridge in Phnom Penh during a race. Cambodia’s annual 3-day water festival celebrates the reversal of the flow of the Tonle Sap River - an event of large cultural significance because of the river’s role in national fishing and agriculture. The event was cancelled for three previous years in a row after the stampede incident in 2010, when nearly 350 people were killed and roughly 750 more were injured. 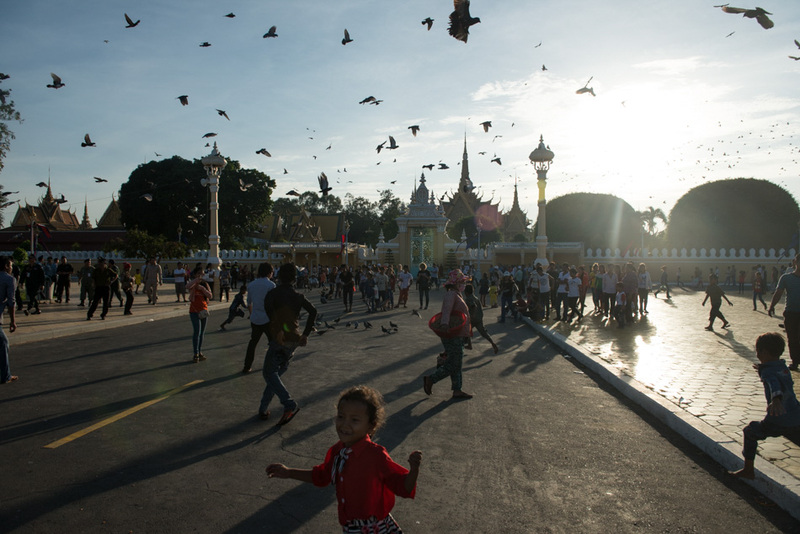 Children play in front of Phnom Penh's royal palace. Cambodia’s annual 3-day water festival celebrates the reversal of the flow of the Tonle Sap River - an event of large cultural significance because of the river’s role in national fishing and agriculture. The event was cancelled for three previous years in a row after the stampede incident in 2010, when nearly 350 people were killed and roughly 750 more were injured. Fireworks explode over the Tonle Sap river. Cambodia’s annual 3-day water festival celebrates the reversal of the flow of the Tonle Sap River - an event of large cultural significance because of the river’s role in national fishing and agriculture. The event was cancelled for three previous years in a row after the stampede incident in 2010, when nearly 350 people were killed and roughly 750 more were injured.